For most of us “a basket of summer fruit” is a pleasant picture. What could be more delightful than a basket full of delicious red cherries, juicy plums and perfectly ripe peaches? But for Amos, the vision of summer fruit wasn’t a pleasant sight. In the scorching heat of the Middle East, summer fruit is quickly overripe fruit. Amos saw fruit that was fast becoming brown and squishy. Ugh! The Prophecy Why did God show Amos a vision of soon-to-be-rotten fruit? It was an object lesson that represented the nation of Israel which had turned away from the Lord and was ripe for judgment. God had been incredibly longsuffering and patient with His people, but they refused to respond to His grace. They had turned a deaf ear to His warnings sent to them through the prophets. Now there was no hope of recovery. As a basket of overripe fruit indicated the end of the summer season, so Israel had arrived at the end of her national existence. As the ripening process in the fruit could not be reversed, so the moral and spiritual deterioration in Israel had passed the point of no return. As a basket of rotten fruit must be emptied and the fruit thrown away, so the corrupt nation would soon be removed from the land and scattered abroad. The “summer fruit” prophecy of judgment took place about 30 years after Amos received this vision. He lived in a day when the land of Israel was divided into two kingdoms: the northern kingdom, Israel (ten tribes), with its capital at Samaria; and the southern kingdom, Judah (two tribes), with its capital at Jerusalem. The prophecies of Amos were directed primarily at the northern kingdom of Israel. In fulfillment of these prophecies, Samaria fell to the invading Assyrian armies in 722 BC. The scattering of captives and the taking of land were so thorough that no trace of the ten tribes exists. Jews today trace their roots to the southern kingdom of Judah. It should be noted that because many individuals from the socalled “lost ten tribes” had migrated to the kingdom of Judah before the northern kingdom was conquered, all 12 tribes of Israel are represented among the Jews today. The kingdom of Judah was conquered when Jerusalem fell to Nebuchadnezzar in 586 BC, but the Jews were preserved as a race throughout their Babylonian captivity. They were reestablished in their homeland about 70 years later under the Persian Empire and existed as a nation until 70 AD, when they were scattered throughout the Roman Empire. Since then, while Jews have intermarried with peoples wherever they’ve settled, they have been miraculously preserved as a racially distinct people. The conclusive nature of the fulfillment of Amos’ prophetic vision (8:3) should make us ask ourselves some sobering questions. 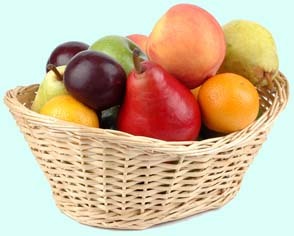 If God gave us a vision of a basket of fruit representing our country, how ripe would it be? And more personally, what kind of fruit would I see if this vision were of my own life? Before looking further at the reasons for God’s judgment of Israel, let’s look at the prophet Amos himself. He was born and raised in the southern kingdom in the little town of Tekoa, near Bethlehem. He was not a trained preacher, nor had he attended one of the schools for prophets. He was just a poor sheep herder and fruit picker – a migrant laborer (1:1; 7:14-16). But God called him to be a “foreign missionary” to the northern kingdom, and he responded. Neither seminary training nor formal education are needed when God calls us to serve. Are we ready to obey His call, even if it means a change in our lives? The fact that Amos was called by God did not mean that he had smooth sailing in his ministry! He was falsely accused of conspiring against the king and told to go home (7:10-13). Amos may have had some doubts about his call at this point. Let’s not be surprised if we hear discouraging words from the very people we are trying to serve. Remember that problems with people are not necessarily an indication that we’ve made a mistake about God’s call. When the going gets rough, it’s very easy to become discouraged and wrongly assume that we’re not where God wants us. Don’t give up. Since when does the Bible say that doing God’s will guarantees smooth sailing? In 8:4-6, Amos gives specific reasons why God had to bring judgment upon Israel: lack of concern for the needy, love for money and cheating for material gain. By using unethical business practices the wealthy were bankrupting the poor and forcing them to sell themselves as slaves (8:4). The unscrupulous rich were buying these slaves for as little as a pair of sandals. The poor were sold wheat which was not fit for human consumption (8:6). The wealthy had an outward show of religion but were really hypocrites (8:5). While going through the motions of keeping the feasts and passovers, they couldn’t wait for the religious days to end so that they could return to making money dishonestly (8:5). The greedy merchants cheated the needy by making the bushel smaller, by increasing the shekel weight the poor had to pay, or by using unbalanced scales. The sins of spiritual idolatry and sexual immorality were also practiced in Israel at this time (2:7; 4:4; 5:5; 8:14). For example, Dan, Bethel, Gilgal and Beersheba were sites of pagan shrines where religious prostitution was practiced. Today’s Christians see idolatry and sexual immorality as “more sinful” and more worthy of God’s judgment, but it was the social injustices which God condemned in the vision of the basket of summer fruit. In 8:7 we read that the Lord swore that these social sins would be punished. How do we stand in reference to social justice? While we Americans pride ourselves on being a country that always helps the underdog, aren’t we often guilty of unjust laws and practices? What about our abortion laws and the rights of the unborn? Does the unborn child not classify as a needy and defenseless person? Also we must admit that usually the dollar rather than the Bible determines the level of social justice across our land. How many payoffs and political deals are being made right now? How many landlords live in luxury while their tenants live in urban squalor? And what kind of social justice is being conveyed nationally by a hypocritical “religious industry” that accommodates corrupt, moneygrabbing individuals? We don’t have to look too far to see that nationally we fall short of the biblical standard of social justice. But what about ourselves as individuals? It’s easy to pinpoint the social sins of a nation, but how do we personally measure up to the biblical standards of social justice? Do we really care about the poor and needy? Is social justice for them as important as our own comfortable standard of living? Would we help an unwed mother or a teenager who was trying to overcome a drug problem? Do we care enough to sponsor a needy refugee family? Would we take on the responsibility of personally caring for a “stranded” widow or orphan (Jas. 1:27)? Would we consider helping just one of the 25 million individuals in our country who cannot read the Bible because they are illiterate? Let’s face it: Like the Israelites of Amos’ day, we too are generally more interested in money and personal comfort than social justice. We may mouth support of social justice but do we put our money where our mouths are? If we do not, then we are part of a system that is largely unconcerned about the sins of social injustice. Again the question comes to mind: What kind of fruit would I see in the basket if God were to give me a vision of my life right now? From 8:8 to the end of the chapter the consequences of Israel’s social sins are pronounced, First of all, the land itself would suffer (8:89). The catastrophic figures of an earthquake, the flooding of the Nile and an astronomical disturbance are all used to describe the coming devastation of Israel. Was this prophecy fulfilled? Ever since the fall of the northern kingdom of Israel, the land that was once so abundantly productive has suffered greatly. Reduced rainfall, unconcerned inhabitants and the ravages of many conquering armies have caused the land to waste away until modern times. The fact that Jesus used similar language to describe the events preceding His second coming may indicate that this prophecy of Amos also speaks of the end time (Mt. 24:27-30). But there is certainly a presentday application. Why is our own land suffering from such problems? Could it be that we’re more interested in personal gain and convenience than in the welfare of the land and its citizens? In 8:10 a second consequence of Israel’s social sins is stated: Joyous occasions would come to an end. When the Assyrians overran the kingdom of Israel there was great suffering. Social life was completely destroyed and many lost their lives as a result of the atrocities of the Assyrians. Loss of joy is always a consequence of sin, including the sin of social injustice. Why does our country suffer today with social tension? Are we not reaping the harvest of the seeds of social injustice which were planted many years ago? A final consequence of Israel’s social sins is given in 8:11-14. They would experience an unsatisfied spiritual hunger. The accuracy of this prophecy may be seen even today in Israel. The people are in spiritual darkness. Many are religious but their spiritual hunger is unsatisfied. Social injustice brings spiritual famine – to a nation and an individual. Selfish concern about our own interests leads to a barren spiritual life. Are you spiritually hungry right now? Are you getting nothing out of your Bible study? Find an area in which you can use your time, abilities and money to help reduce some social injustice. Serving Christ in this way will make the Bible come alive and your whole life more exciting. The prophecies of Amos do not end with the vision of the basket of summer fruit. At the end of this book there is a vision of future blessing – undeserved blessing (9:11-15). God is gracious! Although He had to judge Israel for her sins, He was willing to forgive. The land and the people would be fruitful once again! We should be thankful that our God gives visions of future blessing not only visions of rotting summer fruit!